What is the difference between SAYER cards and normal tickets? The difference between SAYER Cards and normal tickets is that SAYER Card is reloadable / rechargeable, easy access on the bus, saves your precious time while the paper ticket, trip has to be paid to the bus driver in cash which is expensive compared to SAYER card fare. How can I check the remaining balance of my SAYER card? 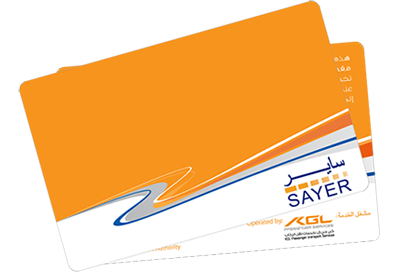 The balance of your SAYER Card is shown in your SAYER ticket issued by the bus driver every time you travel with Mowasalat Buses. You can also check it from the designated selling sales points. What can I do if SAYER card lost or stolen? Immediately call the costumer serves hotline at 600522282 by reporting your serial card number our agent will disabled within 48 hours. Only registered Sayer Card can be hot-listed. Where do I Purchase and Top-Up sayer card? You can purchase or top-up your sayer card at your nearest bus terminal (Jubail Bus Terminal) , sayer retail point, sayer vending machine and on board mowasalat buses. What is the benefit of registering sayer card? Registered sayer card can be hot-listed, an important safeguard should it be lost, stolen or damaged and you can get a replacement sayer card with your details and the last credit balance. How should I look after my SAYER card? Keep your card in its wallet, separate it from other credit / debit cards and don't bend the card.